Here is a list of questions we often hear. If you have a question of your own, please submit it using the “Ask Jordan a Question” form. At times, your car give personal signals which can be deciphered by only the user. Strange ‘hiccups’ while driving indicate faulty fuel which would in turn cause faulty carburetor or fuel injector. If there is unequal or wrong air pressure in tires, it is evident on braking. Unexplained shudders in braking indicate problems in suspension or linkages. Musty odors indicate the existence of some trapped water, usually under the carpet. This will ruin the carpet and also speed up corrosion. The proper solution would be to remove the carpets and dry both the carpet and the floor. What's in a "complete brake job"? A complete brake job should restore a vehicle’s brake system and braking performance to good-as-new condition. Anything less would be an incomplete brake job. Brake components that should be replaced will obviously depend upon the age, mileage and wear. A complete brake job should begin with a thorough inspection of the entire brake system; lining condition, rotors and drums, calipers and wheel cylinders, brake hardware, hoses, lines and master cylinder. It depends on how you drive. If your car always (or nearly always) gets warmed up, and you don’t drive it very hard and keep the revs down, the manufacturer’s recommendation is probably fine. If, however, you drive it hard, drive it at high revs, or alternatively, if you only drive it to and from the supermarket so that it doesn’t get up to temperature, then you may wish to change oil much more often, perhaps at 3000 mile intervals (given that most manufacturers are now specifying 7500 mile intervals.) If you don’t drive your car much at all (about 7500 miles a year), then you probably want to change oil every six months anyway. If you are storing a car during the winter, then change oil before storing it and change oil when you bring it out of storage. Most likely, a pinging sound coming from your engine indicates timing problems. Sometimes pinging is caused by poor quality or low octane fuel. Pinging can cause damage. We strongly advise that to have your car checked out by a professional to determine whether it’s causing damage. Why is T&T better than the dealer? Are you aware that the average car dealership in Minnesota costs 3.7 million dollars to build? At T&T we concentrate on keeping costs down and customers happy. Don’t be fooled by our 1950’s era building. We have all the tools, training and know-how the dealer has at a fraction of the cost. Here are four reasons why you should check us out! No annoying service writers who know nothing about cars. The goal for most dealer service writers is to sell as much as possible. This means you may get sold things that your vehicle doesn’t need. Not at T&T. 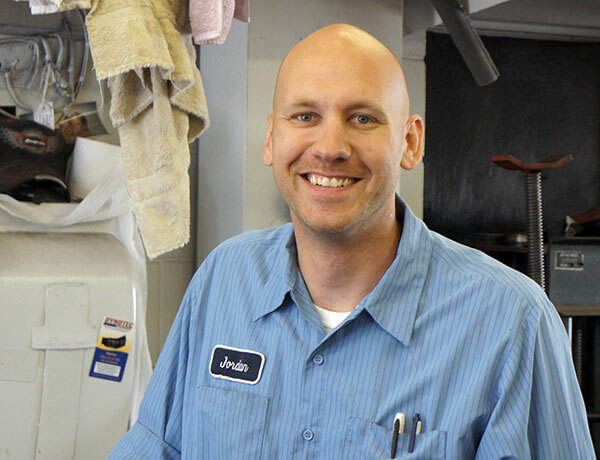 You work directly with Jordan and the mechanics to diagnose and fix only what you need. T&T does not have a standard inspection / diagnose fee. We charge a fair and competitive rate while working on your vehicle . We provide all of the repair options to the customer with a complete price breakdown. We don’t hide anything. We operate our business being up-front and honest about everything. That’s why we’ve been around for so long! Love your dealer ? Love your over-the-top expensive repair bill? Having problems with your vehicle? Ask Jordan a question. Complete the form below and you’ll get a real answer within 24 hours. If it’s a question that others will benefit from, we’ll even post it right here in our frequently asked questions.